A person captured my attention recently with some questions. The questions were these: Should a congregation ever be expected to close its doors? In other words, does a church reach a point in which its life and influence no longer matter? Can a congregations presence become unnecessary? I didn’t answer immediately. Give an off-the-cuff quick pontifical type response. Age and experience has taught me to back off when I’m challenged with such an intimidating bombshell. Why? Because I may become guilty of advancing an agenda that enthrones the Devil and ignores God. Additionally, I may be placing myself in a position where I have no place. No right-of-way. No jurisdiction whatsoever. Thus, any attempt to think about closing a church would be a procedure with which I would have great difficulty considering. For no congregation can ever justifiably relinquich its Divine mandate to announce the gospel message of good news. To cease leading persons to follow Jesus. To no longer minister to the ongoing needs of ones brethren. Congregations are no longer discipling others to follow Christ Jesus. Congregations exist only for US and not for HIM. Congregations are only about ME and not about my BRETHREN. Congregations place their own human ingenuity ahead of God’s wisdom and prayer. Congregations practice and display internal disunity and serve as an alienating enigma to their local community. Congregations fall into the trap of existing only on Sunday so that people are able to get together and catch up on all the latest news and gossip. Special interest groups in a congregation seek to control and shape the church into their own turf. Congregations are more like their culture than being like the Christ they’ve vowed to serve. Congregations are no longer connected to the ministry of outreach in their community. Bob Snyder says the following about the importance of outreach: “The best way to kill a church is to squeeze it into a building. For without contact with people in need and publicly witnessing faith and trust in Jesus, a church will quietly die.” So very true! But pay close attention also to Billy Sunday’s words: “The church is not a dormitory for sleepers, it is an institution for workers; it is not a rest camp, it is a front-line trench.” Sunday is correct in his observations. Yet, while a church isn’t really about working to gain Divine favor, Divine favor does propel Christians into a life of service and “good works!” Divine favor no less energizes Christ followers into being those persons who are making a difference in this dark and confusing world. So, once again for the record, I am not ever in favor of closing a congregations doors. But congregations should definitely avoid the ever present danger of becoming a serious enigma – a question mark in their community. What are your thoughts? One important trait of a healthy church is praise. This is not the author’s conclusion, nor is it someone elses point of view. It is a snapshot of life in the early church (see Acts 2:47). It is how believers functioned as a magnetic fellowship during the first century. But what is praise? How does one get a handle on it? Understand it? Convey it? Can praise be defined or described? Be set forth? Does it have a procedure possessing certain ingredients or steps that one must follow? Can praise be put on and taken off much like a suit of clothes? Practiced only when you feel like it, and ignored when you don’t feel like it? Further, praise is something automatic that requires no procedure manual. It isn’t pre-packeged with a step by step set of requirements. Praise flows naturally like a river. Functions like regular breathing. It needs no control switch to indicate when it’s time to come on and go off. Look again at Acts 2:47. The english Bible text reads, ” … praising God.” In the original language, “praising” appears as a present participle, meaning that the action of “praising” is a natural ongoing process. A non-stop progression. An experience that emerges from an intimate and joyous relationship with the Lord. Healthy congregations are engaged in praising the Lord. Yet, praise is something that has been lost by unhealthy congregations. It has been vacated. Left behind. Forgotten. It has often been replaced in congregational life with griping and groaning; complaining and condemning; feuding and fighting; dividing and destroying. And the emphasis is focused on us and what we want in place of HIM and the difference HE makes in our lives. Whenver this lapse occurs you can be assured that congregations are ready for considerable confusion and chaos. It needs to also be pointed out that the transition out of congregational praise always happens in a rather subtle fashion. Without initial awareness and warning. It takes believers and congregations by surprise. Catches them off guard. Makes them wonder how they have evolved into something different than what God designed and intended them to be. This downward congregational spiral all starts through playing religious games. Through following accepted religious motions. Through living in hypocritical fashions. Doing religious things with an ever increasing set of wrong motives. Going through many forms of cultural godliness, yet lacking the spiritual power necessary to live the transformed life (see 2 Timothy 3:5 and Titus 1:16). Perhaps the right call here is to personal and congregational repentance. Change. Engaging in a turnaround. Grasping anew the Divine relationship. Forgetting church games, and becoming spiritually discerned and aligned again with the originator and perfector of our faith (see Hebrews 12:2 – NKJV). I enjoy observing different congregations. Viewing them with objective and sensitive eyes. I’m able to see their strengths and to discover their weaknesses. To learn about their experiences in making a difference, and to note those areas where difference making is clearly lacking. In short, I’m able to see rapid growing congregations in action, and see, as well, those congregations that are either on a plateau, or, they are going rapidly downhill. A common criticism I hear from many static and non-growing congregations is their great distrust in those churches that are progressing and achieving unbelievable success. There was a time that I was a card carrying member of this negative and unhappy religious church club. In all honesty, it is an unjust kind of criticism. A mistaken posture to take. And there are several reasons for resisting membership in this negative church club. Advancing and progressing congregations enjoy exceptional internal unity and joy. They exude a contagious spirit. They are an unusual assemblage of persons. Those who come into their gatherings for the first time are immediately aware of a cohesiveness that’s unlike any other they’ve ever encountered. Plateaued or declining congregations generally struggle with having cohesiveness. Staying together. Becoming a unified team. Members frequently do not get along. Grudges are held. Dis-satisfaction with the church is voiced or impled by different kinds of attitudes. Even cliquishness pervades the inner life of these kinds of congregations. Progressive and growing congregations rely completely on the power of God to bless their ministry. They are fearless. Brave. Courageious. They’re not afraid to step out of the box and do kingdom ministry, regardless of the cost, time or energy involved. Plateaued or declining congregations talk a language of reliance on God, but their actions are often opposed to their supposed commitment. They are often resistant to spending their money, as well as utilizing freely their time and energy. Control of everything is also present, and the Spirit of God is largely ignored. Progressive and growing congregations are kingdom oriented. They accept God’s rule over everything. I do mean everything. And they cooperate with God completely in thinking as He would have them think, and serving as He would have them serve. Plateaued or declining congegations are more about their religious organization than they are God’s Kingdom. Decisions are made on a human plane. That is, what leaders in the local church think and what they want. Even prayer will be used as a ploy to mask or cover their “this world” thinking and action in their fellowship. Progressive and growing congregations are out of step with simply playing church. Going through established religious motions. Having a hypocritical posture of looking and acting churchy. Attempting to please a grouchy and demanding membership. Religious ruts of the past are by-passed. They want to see and experience God’s will in operation. The only control they wish to experience is the pervasive presence and power of the Holy Spirit. My ultimate advice and counsel is this: IT IS TIME TO QUIT FINDING FAULT AND TO GET IN STEP WITH THE KING OF THE AGES!! There are two extremes at play among congregations. This is not some armchair idea i’ve imagined and then hatched. I’ve seen it as well as experienced it. I have learned that some congregations play heavy on emotion and steer clear of rational conclusions to their faith. On the other hand, some congregations play heavy on the rational side and remain clear of any emotional response to their faith. Extremes, I’ve learned, are always dangerous. Damaging. To be avoided. Without exception. Why? Because extremes lead you into responses and practices that end up in the arena of imbalance. Congregations that are rationally directed in the extreme, for example, glory in always being right. Correct in their doctrine. In their teachings. They enjoy argument and debate. Controlling everyone’s thinking. Being able to prove their point with numerous explanatory excursions. The only thing that matters for this group is with those established conclusions that have been traditionally etched in stone and carefully passed on from one generation to another. Dialogue isn’t possible. Another point of view is not allowed. All other views are taboo. Congregations that are emotionally charged in the extreme pose yet another problem. Another dangerous directional approach. A false road map. In fact, it can be most lethal to the validity of the Christian faith. Predictably, this group is not able to carefully explain their faith. What it is that underlies their emotional responses. The mental side of faith is avoided. Rejected. Viewed with fear. It is thought to be the territory of formal and dead congregations. Such dangerous religion as these formal congregations demonstrate to this group is to be avoided like the plague. If it feels right, it’s okay. But if the feelings aren’t present, then faith is cold and callous. It lacks warmth and winsomeness. Eugene Peterson puts the teaching of Jesus in simple language when he gives the following rendering of the teaching in Matthew: “Love the Lord your God with all your passion and prayer and intelligence.” Thus, emotion and thought are not opposed to one another in the teaching of Jesus. Quite the contrary, they serve to balance out a Christian response to one’s life and ministry. Until we overcome this divisive barrier we cannot work and serve together. Nor can we be a consistent witness to the world around us. A healthy church will give evidence of both expressions. And when the objective truth of God’s Word is consistently matched with the appropriate subjective response, the powerful nature of the Christian message will fulfill its God loving and honoring end. Love is in the air. It’s everywhere. You can see it. Hear it. Feel it. Taste it. Smell it. You cannot escape its pervasive presence. At least there is a special set aside day one can experience this love in the world. For it is alive. Vibrant. Pulsating. School kids share valentines. Expressive cards of love are given by friends and family members. Men propose and offer engagement rings. Husbands and wives search for that last minute love gift for their spouse. It is indeed a day of love. Great demonstrations of love are quite clearly all around us. Many of these demonstrations serve to touch us deeply. Bring broad smiles. Draw forth tears. And often leave us breathless. 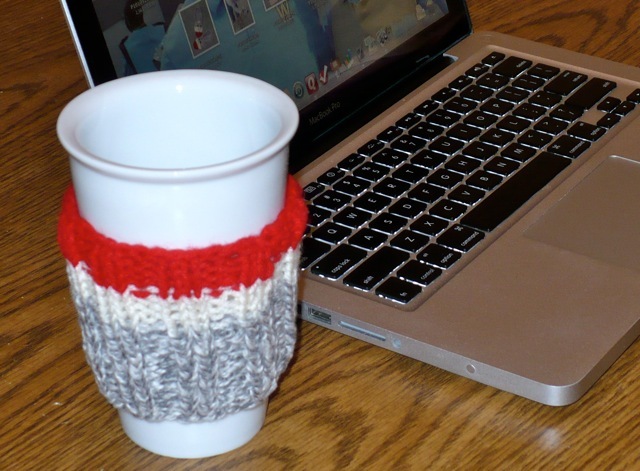 My wife has been knitting coffee cup sleeves. They are designed to keep the coffee cup from burning ones hand. Several onlookers have already raved about them. Have said they wanted one. I bragged: “I really think that I could get one for free if I tried real hard! !” And you know what? This morning at my computer a beautiful coffee cup sleeve from Sue was wrapped around my coffee mug and waiting for me. It’s a love story. And as I’ve already indicated, love stories are all around us today. Why? Because it’s Valentine’s Day. The heart day. The love day. When giving and receiving take on a very special degree of operation in our lives. But human love falls hopelessly short when placed alongside another kind of love. For no degree of human love and devotion can ever come close to measuring up to the kind of love that God demonstrated for the world. It was the matchless romance of the ages. The love that could never let us go. This love began long ago as a baby in a manger. Continued its expression as the baby became a man and modeled God’s love on earth. It culminated finally in the greatest sacrifice of the ages: When God died on that cruel Roman instrument of torture for the sins of the whole world. Those sins included yours and mine. For our sins were the cause of Him being there!! Whitney Houston reminded me again of God’s great love when she sang prior to her death, “Jesus loves me this I know … ” And Karl Barth, the famous theologian voiced those same words when he was asked to share the most profound truth he had ever encountered. Our hurting world needs to hear this message again and again and again. That God loves them. Loves them dearly. And is reaching out to them. Pursuing them. Seeking their rescue. He demonstrated this love of the ages through the death of His Son. “Greater love has no one than this, than to lay down one’s life for his friends” (John 15:13 – NKJV). This is the love message that can never never grow old. Become out of date. Cease to no longer matter. And a healthy church will be aflame with this Divine romance of the ages! !